Following a good example from Jim Charlier and the Buffalo Fling in 2010, I would like to gather all your posts about Asheville Fling 2012 in a collection organized by gardens, or as close to that as you make them. 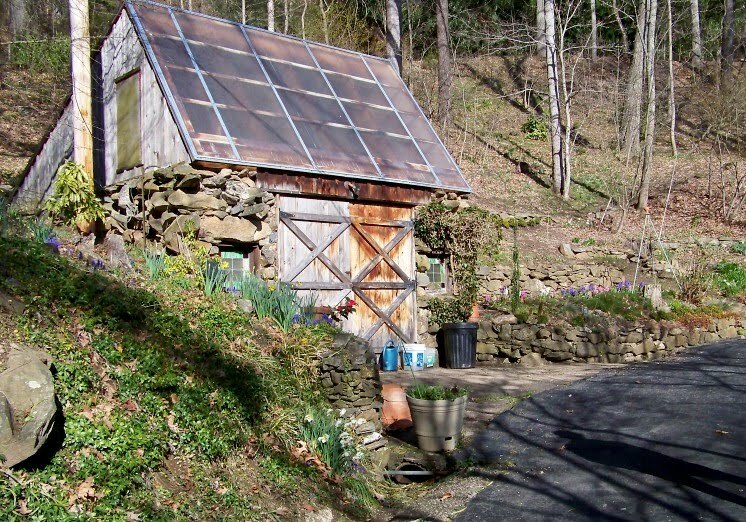 Please posts links to your blog posts in the comments section here so I may have easy access to them to curate into new posts directing folks directly to your visions of Asheville, it gardens and gardeners. Don't worry if the comment section gets long. This will only be a landing place for organizing them into groups for further posts. I like to have things organized. I bet you will too. Thank you all for coming to Asheville from your very happy Planner Man and the entire team who put this on, FrancEs G., Helen Yoest, Lisa Wagner, Nan Chase, Rebecca Reed and my super minion Ana Calderin. 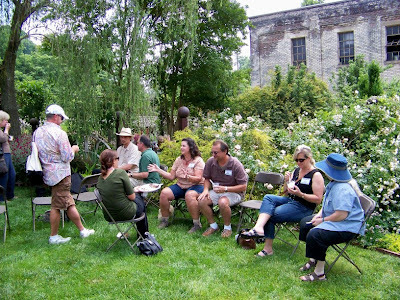 These are links to posts from Asheville Fling 2012 on the Sunny Point Cafe kitchen gardens. These are links to posts from Asheville Fling 2012 on the wild cultivated gardens high on the low spot of a North Carolina mountain top. 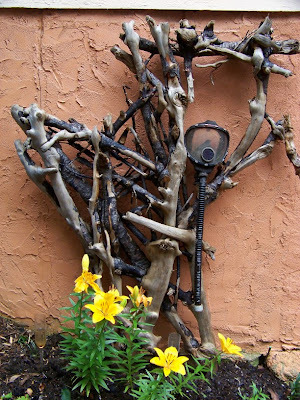 Garden Blogger Fling: where do I begin? 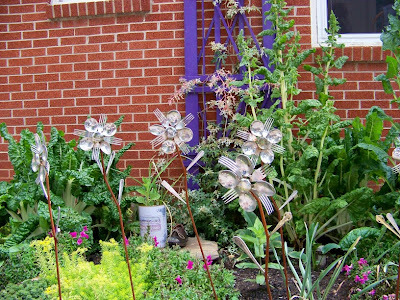 These are links to posts from Asheville Fling 2012 on the Burton Street Community Peace Garden. These are links to posts from Asheville Fling 2012 on Sow True Seed. These are links to posts from Asheville Fling 2012 on the Biltmore Estate. 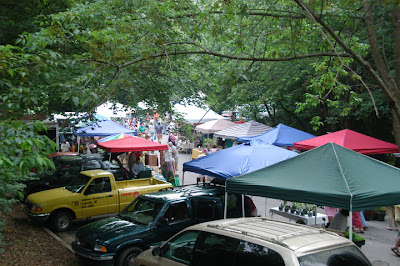 These are links to posts from Asheville Fling 2012 on the White Gate Inn. 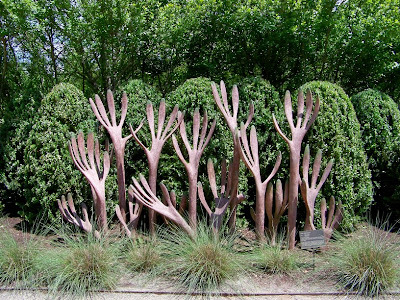 These are links to posts from Asheville Fling 2012 on the North Carolina Arboretum. 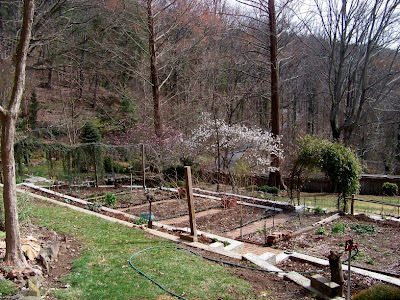 These are links to posts from Asheville Fling 2012 of Peter and Jasmin Gentling's garden. 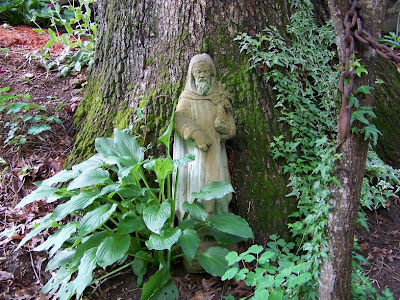 These are links to posts from Asheville Fling 2012 on Christopher Mello's garden. We still have another day of official Fling and a post-day visit -- what fun! But I've been so appreciative of the great garden hosts we've had so far - Damaris and Ricki Pierce at Wamboldtopia, Christopher Mello at Gnomon, Safi and DeWayne at Burton Street Community Peace Garden, Melissa and the owner (whose name I don't know) of Sunny Point Cafe. 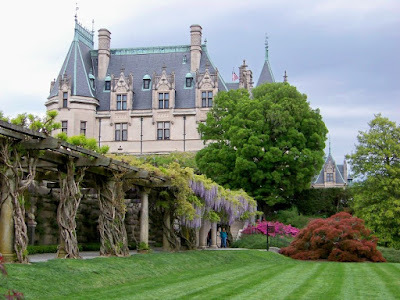 Peter and Jasmin Gentling were extraordinary gardeners and wonderful hosts today and Parker, Susanna, and LeeAnn were equally gracious at Biltmore Estate. Pattiy from Curve Studios (our lunch location yesterday) sent a nice note along with a link to these photos of our group in her garden (posted to her studio Facebook page). She said "thanks again to all your folks for making such a fun afternoon in my garden. it was a joy! please stay in touch!" And the swag this evening -- WOW! Thanks to all of the sponsors who contributed everything from seeds to worm castings. I had no idea (thanks to Helen Yoest for being the sponsor point-person!) Two bags of goodies! Special thanks to our blogger community for contributing through their businesses or directly -- and to Nan Chase, too, for contributing her home as the mailing address. 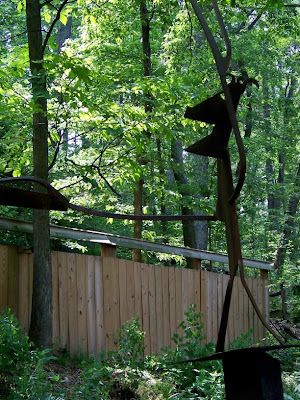 If you're here on Monday, don't miss visiting her garden and bark house on the post-Fling breakfast visit. 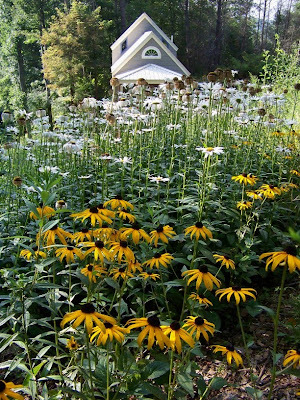 And if you have a bit more time -- the nearby gardens marked on the map that was in your packet are well worth exploring -- and the Botanical Gardens of Asheville - a 50+ year old native plant garden adjacent to UNC-Asheville (founded by a previous owner of the Gentling's property) are a local treasure. I haven't had time to even download my own photos yet, but look forward to seeing yours! A question this evening about bus departures and the itinerary in your packets prompted this bit of clarification. 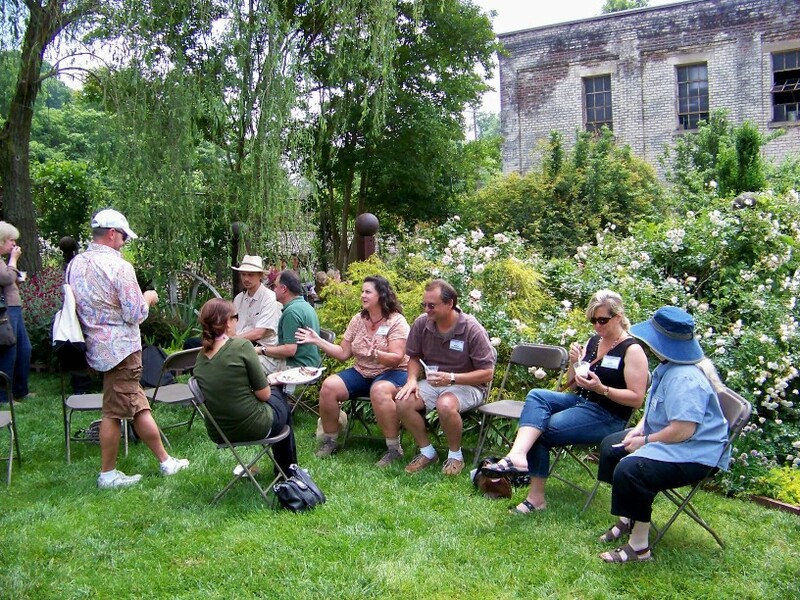 The itinerary describes garden visiting times, not bus departure or arrival times. Please pass on to your fellow bloggers that the Fling blog has all the details, not the packets. Please be ready to board the buses (they'll arrive at 8:40 am) for departure at 9 am. It'll be a fun Fling! Christopher has done a great job of posting detailed descriptions of our itinerary on the blog over the past weeks (and months). Please review them online, as you like, as we didn't print them out again for you, keeping the information in your packets to a minimum of printed material --we're big on reducing waste in Asheville! (Please tell fellow attendees who haven't been keeping up that they need to look at the Asheville Fling site if they want to have more information). OK, you're already here, so you're up to date! 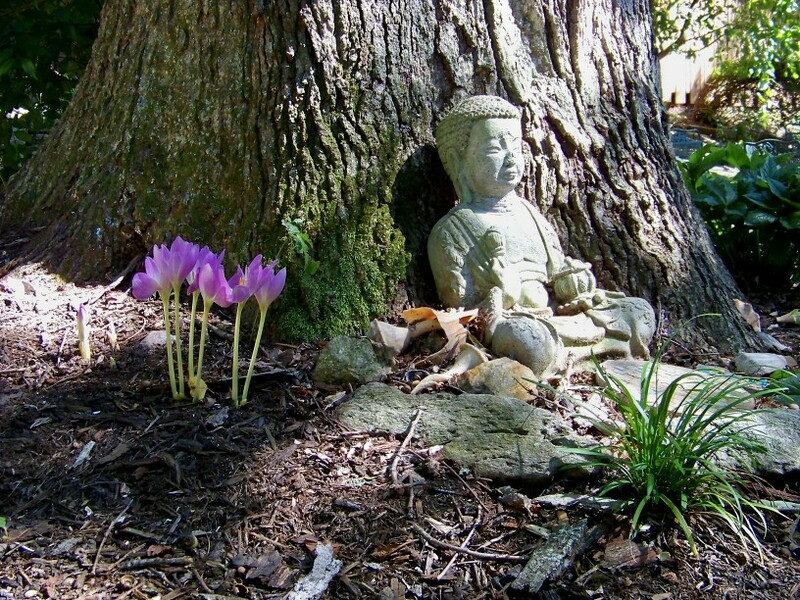 We'll be on a tight schedule on Friday morning (we're starting out with a bang with eclectic gardens in West Asheville), but the pace is more relaxed on Saturday and Sunday. We hope to see many of you at Tressa's tomorrow evening (and those of you that can visit Sow True Seeds earlier will have fun-- they're a great small seed company). Otherwise, we'll see you for the bus departure on Friday from Four Points promptly at 9 am. Be there early! Explore Asheville (the official Asheville tourism site at the Asheville Convention and Visitors Bureau) is sponsoring a garden bloggers contest (inspired by our visit, but open to any bloggers out there). Complete contest information is described at this link. Here are the basic details, too. 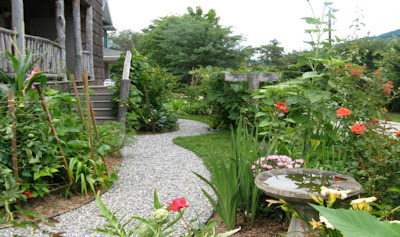 Spread the word about Asheville gardens and win a trip! We're offering a chance for garden bloggers to win a free trip (and maybe return!) to the scenic Blue Ridge Mountains. Whether you write about flower gardens, vegetable gardens or rock gardens, all bloggers are welcome to participate in this contest. 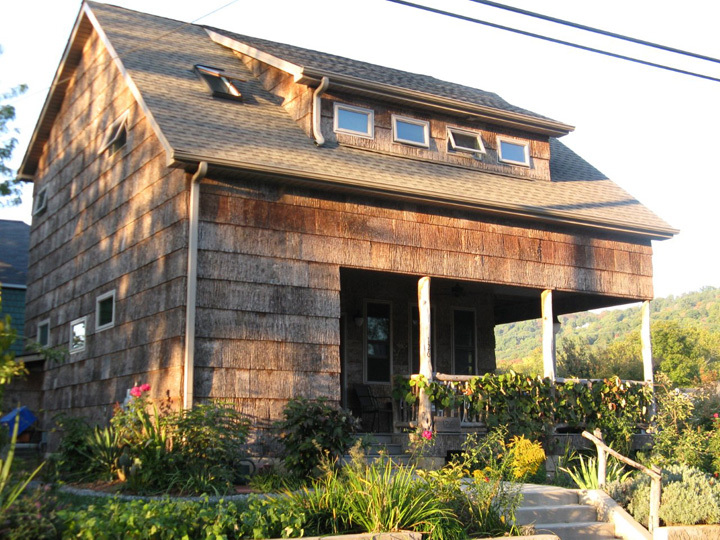 - 2 nights accommodations at a local Bed and Breakfast. - 2 Tickets to Biltmore. - A gift basket of assorted goodies. 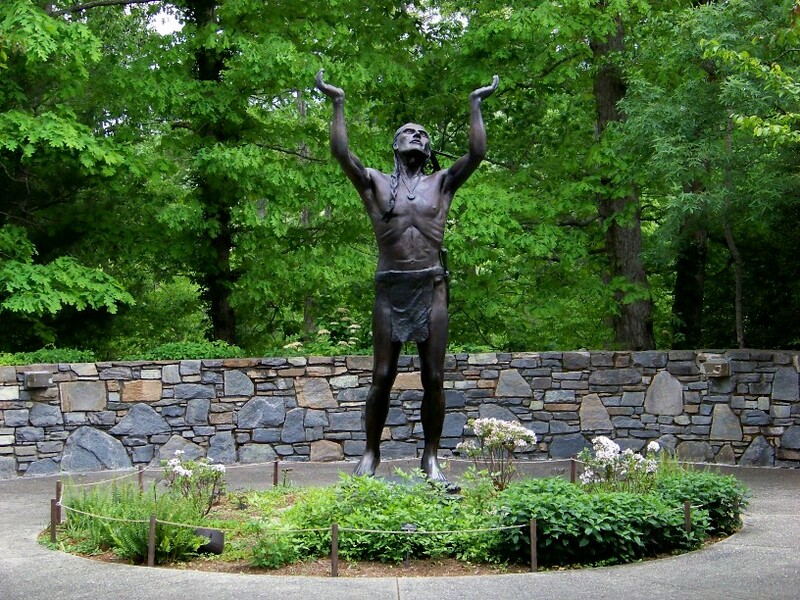 - Send a link of your blog post to dholston@exploreasheville.com. Include your name and telephone number plus any social sites you're a part of so we can connect online. Social sharing equals more chances to win! 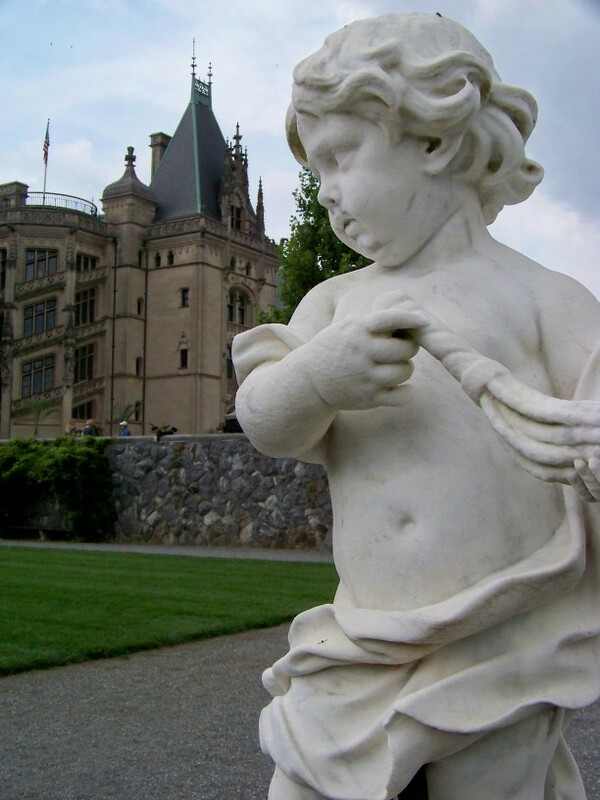 - If you're on Twitter, tweet your blog entry and tag @VisitAsheville. We'll put your name in the hat an additional time. - If you're on Facebook, follow us at facebook.com/asheville and tag @Asheville in your post. This also will get you an additional entry. All entries must be received by June 22nd at 5PM EST. Day three of Asheville Fling 2012 will begin in the parking lot of the Four Points Sheraton with the loading of the buses beginning at 8:45 am. The buses will leave promptly at 9am. Do not miss the bus. Our generous sponsors Corona Tools, the Whitegate Inn and Gardener's Hollow Leg are all helping cover the expense of the buses for the three days of Fling. For our final day of Fling we will be headed to the country and deep into the woods. Our first stop after about a 40 minute drive on coach buses with restrooms will be the gardens of Haywood Community College. This is an acre and a half to two acre teaching garden for the horticulture program at the college. 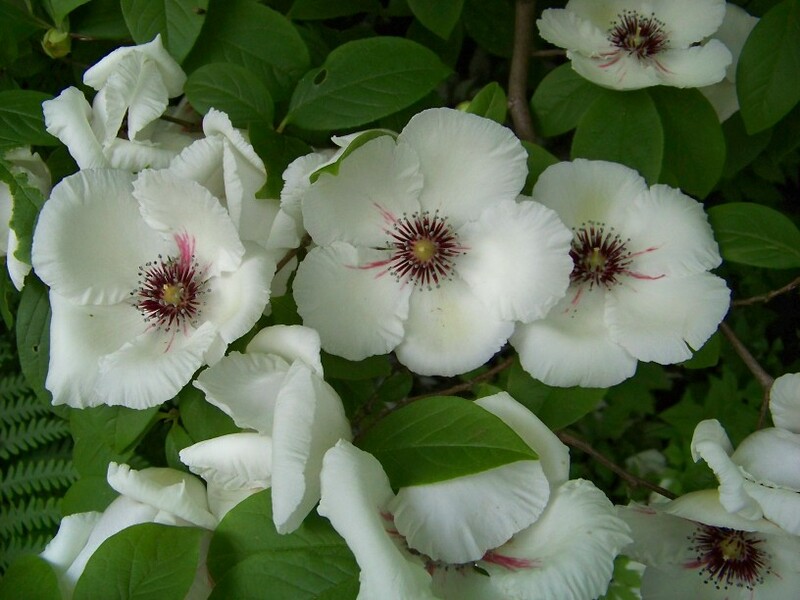 It has an extensive collection of trees, shrubs and perennials for plant ID classes. It is also laid out as a garden, not field rows, which makes it a pleasure to visit as a garden destination. Now a strange thing happened when I contacted the head gardener and asked if I could bring 80 plus garden bloggers to visit the garden. He said they were closed on Sundays period. We could come, but the gates would be closed and we would have to park outside and walk in. 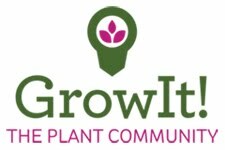 I contacted their marketing and media department thinking all this free PR for the horticulture program might entice some interest and the answer was still, we are closed on Sundays. The gates will be closed and you will have to park outside and walk in. No representative from Haywood Community College, other than security, will be there to greet us. So we will park outside the main gate and walk in to the garden. 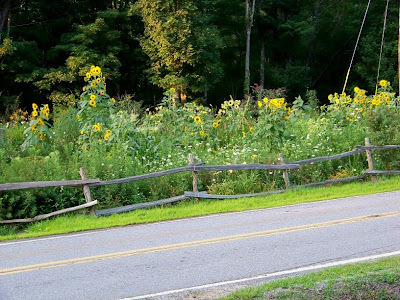 It might be a hundred yards from the gate to the gardens along a tree lined paved road. You will be practiced at walking distances after your visit to the Biltmore Estate on Saturday. We will load back on the buses and head into the wilderness at 11:15 am. Our next stop is the two side by side wild cultivated gardens of Bonnie Brae and Ku'ulei 'Aina high on the low spot of a North Carolina mountain top. This is the home of the blog Outside Clyde and the roadside vegetable garden with wood chip mulch. There's vegetables in there behind that fence all summer long, I swear. Lunch will be served first thing when we arrive and is being prepared by The Sweet Onion of Waynesville, NC. After lunch you may wander into the exuberant chaos that are the gardens I call home. Bulbarella will join us for lunch and the afternoon visit in the gardens. You may ask her anything about her methods of gardening. You may ask her what a particular plant is as long as all you want is a species or common name. 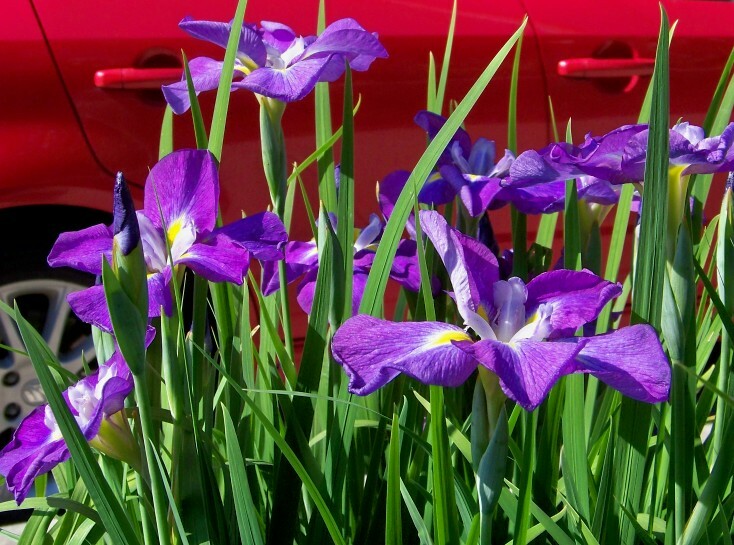 If you are looking for a specific cultivar name you will be out of luck. It's pretty. That is all that matters. 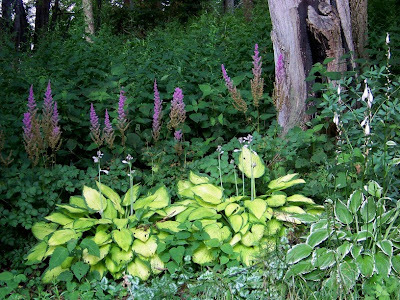 A large portion of the three acres of land under semi-cultivation on this mountain top is a shade garden planted directly into the undisturbed forest. 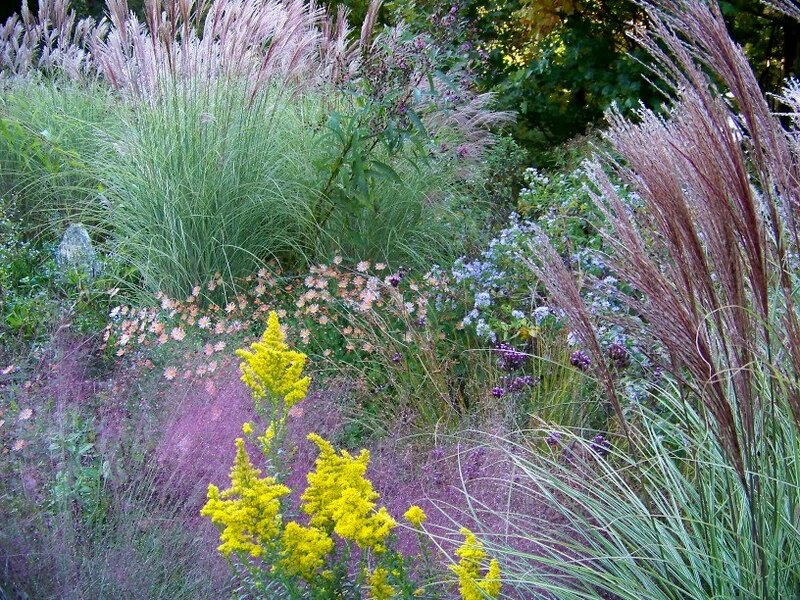 Sunnier sections are put to full use for the sun loving perennials. Narrow, undulating, slightly rocky, one person wide foot paths wander through it all. Walking through this forest wonderland is very much like taking a hike on the Appalachian Trail. STURDY WALKING SHOES ARE ESSENTIAL. This is no place for a fashion statement in footwear. At 2pm several of our sponsors will be hosting a wine service and plant forum. This will be your chance to get liquored up and tell the growers and marketers what you really want from them in plants and how they are sold to you the gardener. Plant Development Services, Inc. works closely with the nation’s top growers and breeders to bring plants to market that solve landscape challenges and have a high impact on the marketplace. 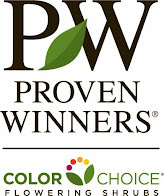 With a comprehensive grower network, Plant Development Services is able to manage distribution to all regions and market channels.. Plant Development Services boasts top ranking brands including: Encore® Azalea, Southern Living™ Plant Collection, and the Sunset Western Garden Collection™. For more information on Plant Development Services, visit: http://plantdevelopment.com. Kip McConnell, Plant Development Services, Director. Since graduating from Auburn University's Ornamental Horticulture program in 1984, Kip McConnell has built a career in the horticulture industry, gathering experience in a range of areas including botanical garden management, retail merchandising, landscape design and installation, and nursery supply sales. 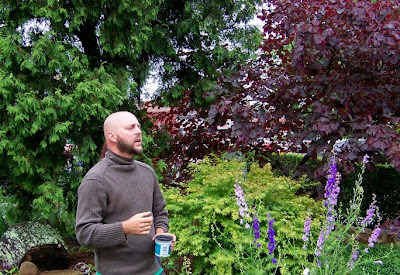 Steve Bender, the Senior Garden Writer at Southern Living, where he has worked for the last 28 years in what he describes in jest as "to everyone's dismay". He co-authored Passalong Plants with Felder Rushing before there was internet and later edited the. Southern Living Garden Book. Shelly Gustafson - Axiom Marketing Communications Account Manager that works on various Home and Garden accounts including Bailey Nurseries on Endless Summer Hydrangeas, First Editions Plants and Easy Elegance Roses Brand PR. Shelly has been a garden lover from an early age and her first “job” (at ten) was working in the gardens at Como Conservatory in Saint Paul, MN. She has worked at Axiom for over five years and contributes to the agency’s garden blog 29MinuteGardener.com. The cozy cabin, Hale Mana will also be open for inspection during our visit to the low spot high on a North Carolina mountain top. Some of you have watched the four year long process of it's construction. Now you will see it in person and what remains to be completed over the next four years. The buses will leave for downtown Asheville and the hotel promptly at 3:30 pm. Don't miss the bus. It's a long hike back to town. Enjoy another evening on the town in the perfect weather that is in store for us the entire weekend of the Fling. Asheville is a tourist destination from spring to fall, because of our setting and the surrounding mountains. And it's been that way for a long time. From George Vanderbilt (at the turn of the last century) and E.W. Grove (builder of the Grove Park Inn, the Grove Park neighborhood, and the Grove Arcade downtown), Asheville flourished through the end of the logging era, right up to the Great Depression. The art deco buildings and historic neighborhoods (Montford, Kenilworth, Albermarle, Chestnut Hill, and Grove Park) all derive from that period. 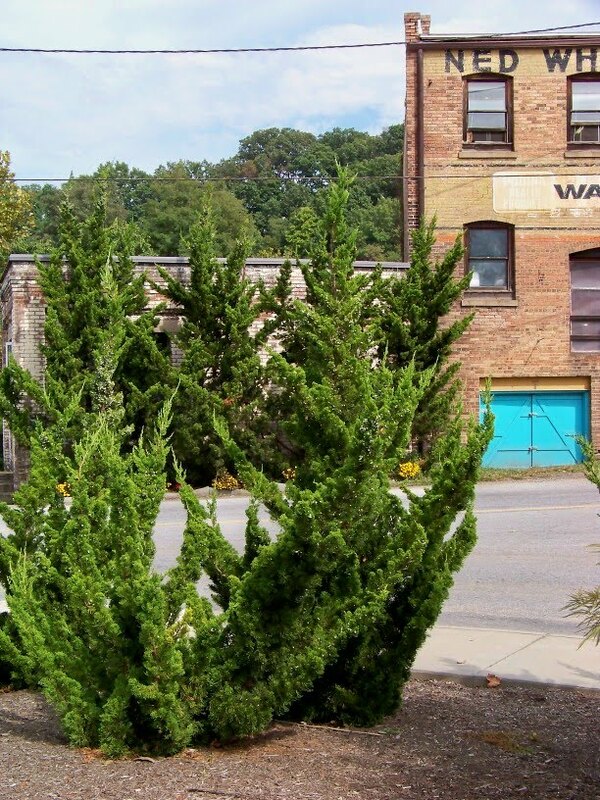 The renaissance of downtown Asheville has happened over the last 20+ years, or so, as the formerly deserted downtown was gradually repopulated with restaurants, galleries, and shops. The distinctive architecture of downtown was saved through Asheville paying off (or not taking on) depression-era debt (as I understand it), then mouldering along until revitalization. There was even an early urban renewal suggestion (yikes) to convert part of downtown to a mall, I think, that was turned back by voters, probably because of cost, but I don't remember the details of the story. My gardening companion and I started visited Asheville near the beginning of that time, in the early 80's, and it's been a remarkable transformation to see. There's lots more to learn about Asheville at the Asheville Visitor Center, just off highway 240 at the Montford Avenue exit (it's an easy walk from the Four Points, too). 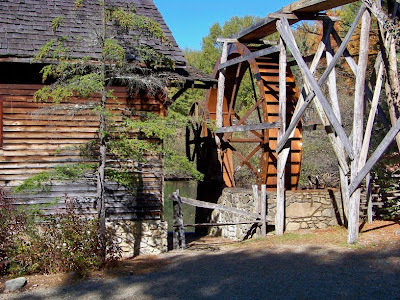 They have helpful folks and excellent information for visiting Asheville and beyond. If you're coming early or staying beyond the Fling, here are some places not to miss. ~ Biltmore Village (a historic area full of interesting shops and restaurants-- my favorite is the Compleat Naturalist -- they're great supporters of exploring the natural world of the Southern Appalachians). 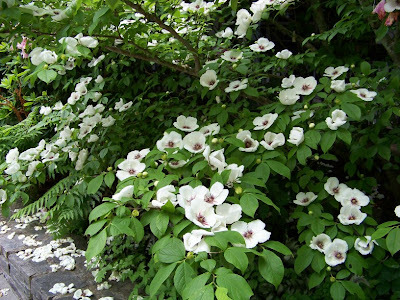 And if you have time, or want to come back, explore the rich botanical diversity and natural gardens that the Southern Appalachians provide -- you'll have a taste in Christopher's garden and beyond, but there are wonders beyond. (P.S. My gardening companion, Tim Spira, will be doing a couple of native plant walks at the NC Arboretum on Friday afternoon as part of the Fling, if you're interested in learning more about native plants and their ecology in the Southern Appalachians.) But there's lots to explore there on your own, too. An information packet has been assembled for every registered attendee and their guest if applicable. We did our best with names, but some in the guest category/groups may remain nameless until they fill in their name tags and a few did not register with last names. So be it. For those booked at the Four Points Sheraton your information packet will be available for you when you check in. Please ask for your packet when you check in. If you are sharing a room or a party of 2 and the room is not booked under you name and we were not sure who was also in your party, your information packet may not be there. DO NOT PANIC! Between 5pm and 7:30 on Thursday all the information packets will be at Tressa's, not at the front desk of the hotel. If you are coming in late on Thursday and will not be at Tressa's, I know there are a few, the remaining unclaimed information packets will be taken back to the front desk of the hotel after the event at Tressa's. Your name tag and Saturday dinner entree choice with a number on it. DO NOT LOSE your name tag and dinner choice card with the number on it. The entree choice card has been placed inside your name tag holder. This entree card should be placed on the table when you settle in for dinner to aid the cater waiters in serving dinner. You will need your name tag to be identified as part of our group to be served at the Biltmore's champagne toast. You will need your entree choice card for Saturday's dinner. No changing your mind on dinner, no substitutions. The number on your entree card will be used for the drawing to give away all the door prize swag we have. And our sponsors have given us some very cool swag. No entree card with a number on it, chances are good you will eat what you ordered for dinner on the registration form by process of elimination and being the last person served. No number. No door prize. No chance. Many of you have signed up to visit Nan Chase's garden on Monday morning, May 21, post-Fling. It's an easy walk from the hotel. You'll pass by the White Gate Inn's charming garden on the way (don't miss visiting it). Both locations are marked on the maps that will be included in the registration packets. Nan's garden was the “grow garden” for her upcoming book Vegevore! 50 Great Vegetables from A to Z, which will be published in spring 2013 by Gibbs Smith Publishers. 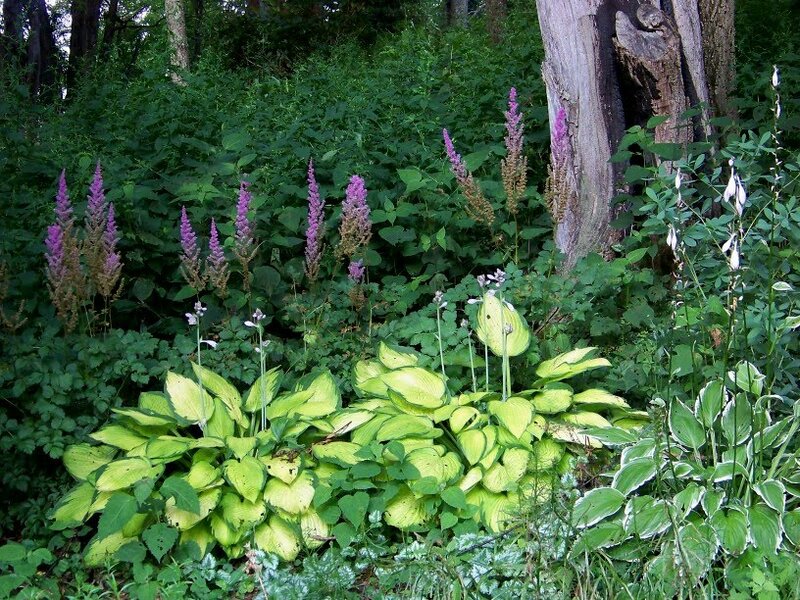 Some of the plants included in her 2010 book Eat Your Yard! 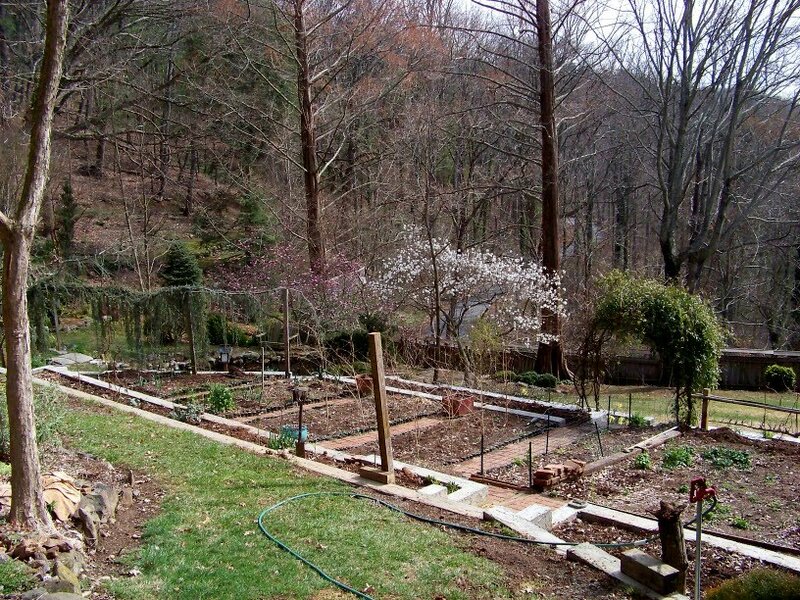 Edible trees, shrubs, vines, herbs and flowers for your landscape were also grown in this garden. 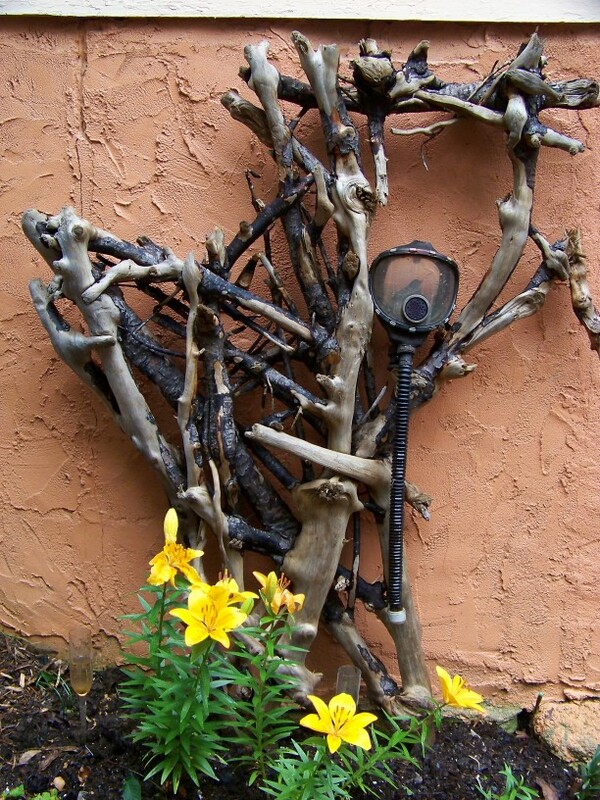 You'll see a variety of fruit trees, berries, shrubs and herbs, in addition to perennial and annual vegetables and herbs, mixed into a wonderfully vibrant urban garden. The roses were beautiful when I dropped by recently. 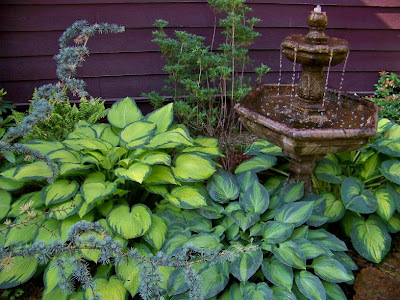 Check out Nan's Broad St. plant list for more information, as well as for background on her bark house. 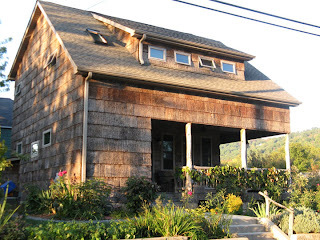 The bark house is fascinating, built as Nan and her husband Saul's new home in Asheville in 2008. 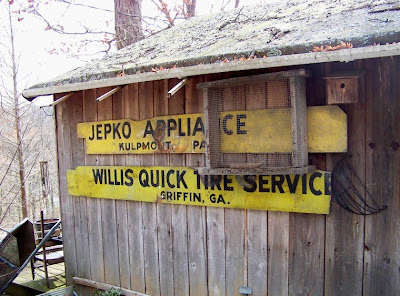 This article, recently published in Appalachian Voices describes its virtues and history. P.S. 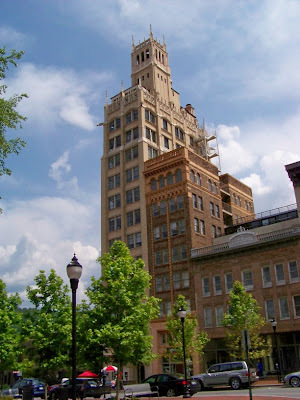 If you're interested in learning more about Asheville's storied architecture and built environment, Nan's book, Asheville: A History, is a great reference. Look familiar? Look up. 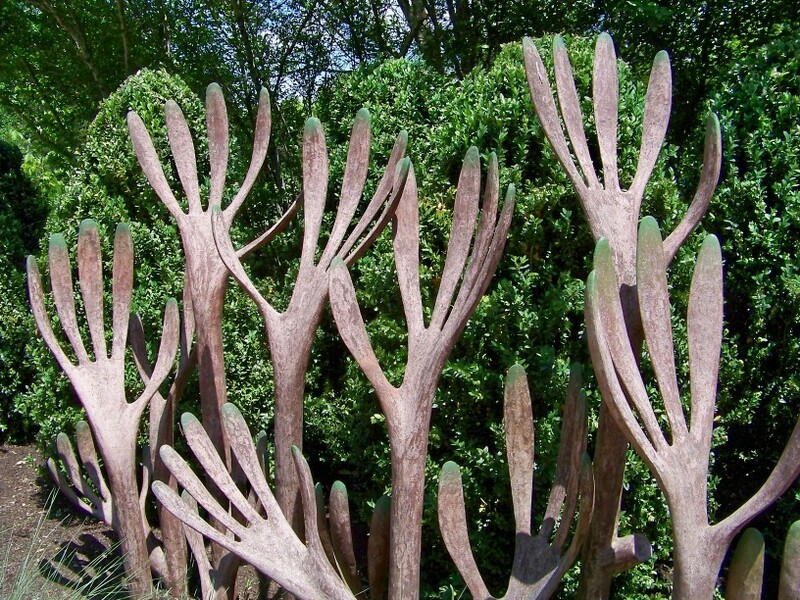 A photo of this sculpture at the NC Arboretum was taken by me nearly five years ago and used as the header for The Asheville Fling 2012 blog. I needed something striking, something pretty, something gardeny, something uniquely Asheville for the header. This sculpture fit the bill. 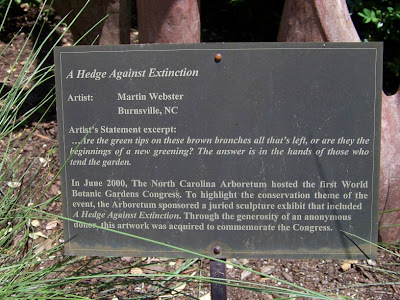 The Arboretum even uses this work in their promotion and advertising. 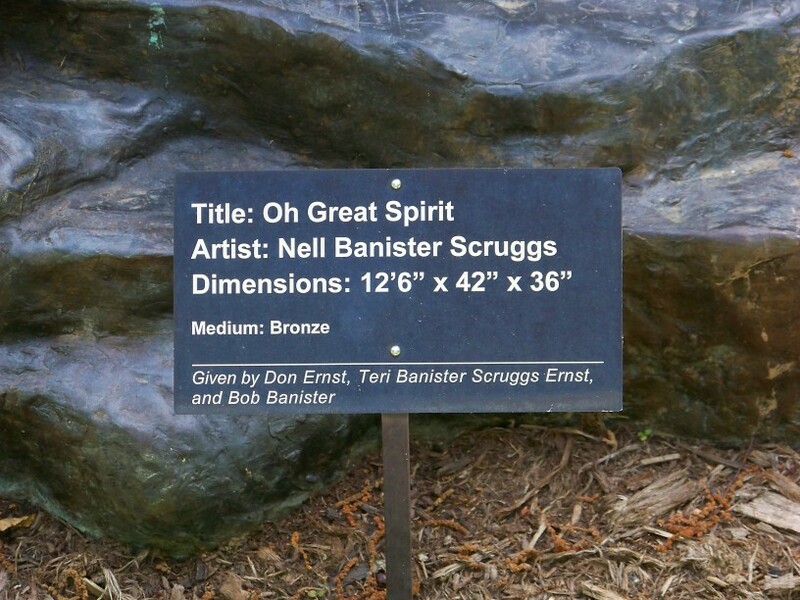 But I did not know who the artist was after all these years. Today I will fix that. 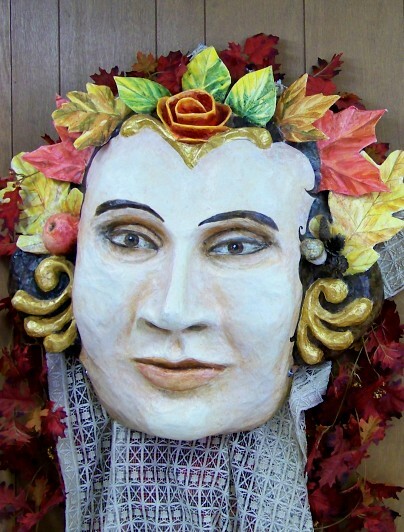 Martin Webster of Burnsville, NC is the artist of this wonderful work. I also saw a living artist while at the NC Arboretum today. 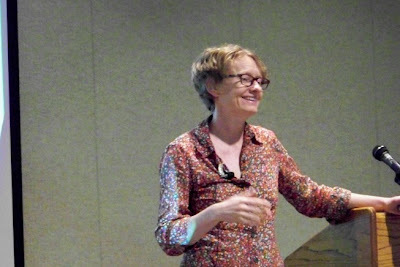 Amy Stewart, a botanically bent author gave a talk on her book Wicked Plants to mark the opening of the Arboretum's exhibit based on her book. 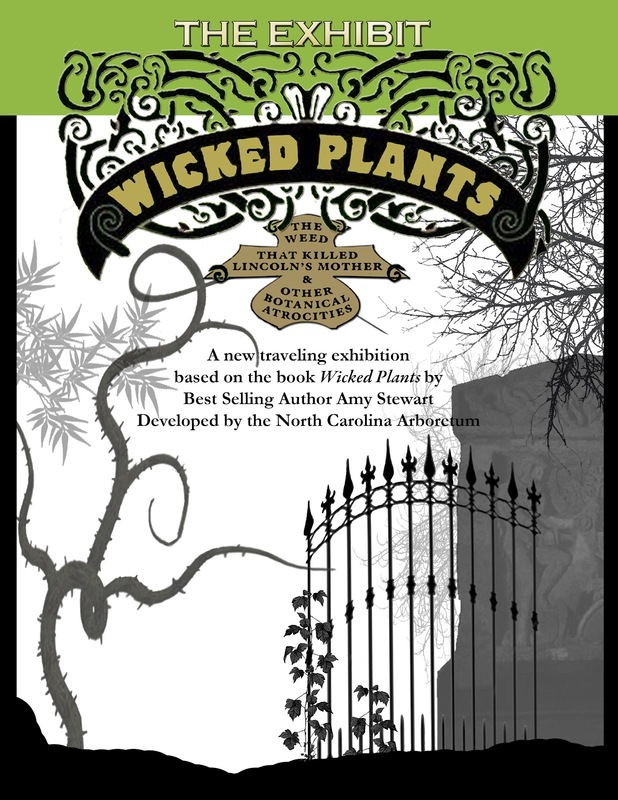 The traveling Exhibit Wicked Plants runs through September at the Arboretum and will be there for your pleasure when the bloggers arrive in less than two weeks. 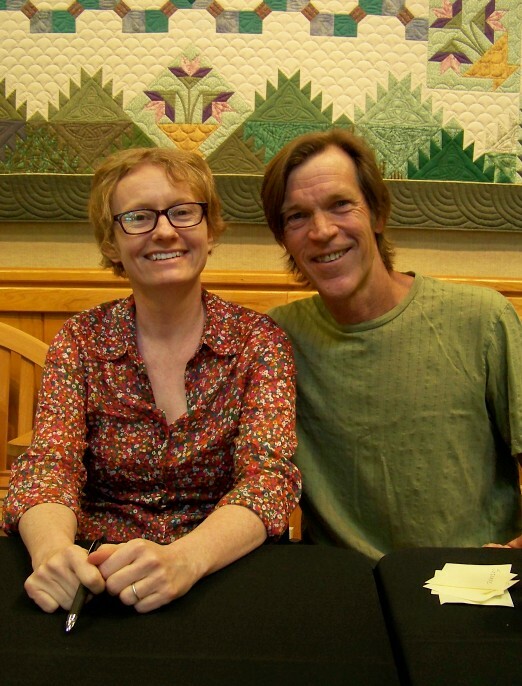 I bought two books so Amy was kind enough to autograph them and pose for the camera with me. I have now met all four Garden Ranters. It's official. I am the Fanboy as some Chicago commenter snidely remarked. Speaking of Stewartias. This native Mountain Camellia, Stewartia ovata var. grandiflora I think was in full bloom next to the education building. I want one, though the elevation information does not bode well for me. It has been about two years since my last visit to the NC Arboretum. In that time a new sculpture has arrived. I like it. This artist won't have to wait five years for me to give her credit. I might post a few more enticing pictures of my visit to the NC Arboretum later or you can just wait til you get here and see it all for yourself..
Day two of Asheville Fling 2012 will begin in the parking lot of the Four Points Sheraton with the loading of the buses beginning at 8:45 am. The buses will leave promptly at 9am. Do not miss the bus. Our generous sponsors Corona Tools, the Whitegate Inn and Gardener's Hollow Leg are all helping cover the expense of the buses for the three days of Fling. DO NOT MISS THE BUSES. THE ONLY WAY TO ENTER THE GARDENS ON SATURDAY IS ON THE BUS!! The garden of Peter and Jasmin Gentling is located on a mountain above Asheville and is reached by a narrow, barely two lane wide road. There is no parking. It's location will not be disclosed. Be on the bus or you won't see it. You will be rewarded for following instructions. Two plus acres of a collectors garden on a terraced mountain side await you. I first visited on a cold and windy day when the first hint of spring was stirring. It was obvious from what I saw that in another couple of months the garden would be filled to overflowing. I strongly recommend a good pair of walking shoes. The garden is steep with many stone steps going from terrace to terrace. A native woodland garden extends off one end for a nice leisurely stroll. Shrubberies and flowers abound. Two Dawn Redwoods tower above it all. Lunch will be served in the Gentling garden by Laurey's Catering beginning at 11am. The buses will load and leave for our next stop at 12:30pm. Now you may certainly enter the Biltmore, our next stop on Saturday on your own. It is a public place. However if you are not on the bus with the garden bloggers you will pay the entry fee that is running around $60 a head for same day tickets. I'd recommend being on the bus. 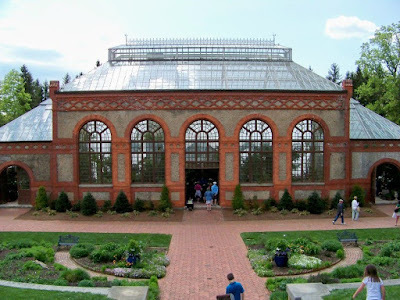 You can use that money to buy plants at the gift shop and nursery behind the conservatory. When we first enter the estate a staff gardener will join each bus who will be able to give a brief historic overview about Biltmore and Frederick Law Olmsted's impact on the development of the grounds and the forest as we drive the three miles to the gardens. Each attendee will be given a copy of the original 1895 guide map which shows the original planting plans. Staff gardeners will also be stationed at specific places on the grounds for you to ask probing questions while you stroll the magnificent gardens. 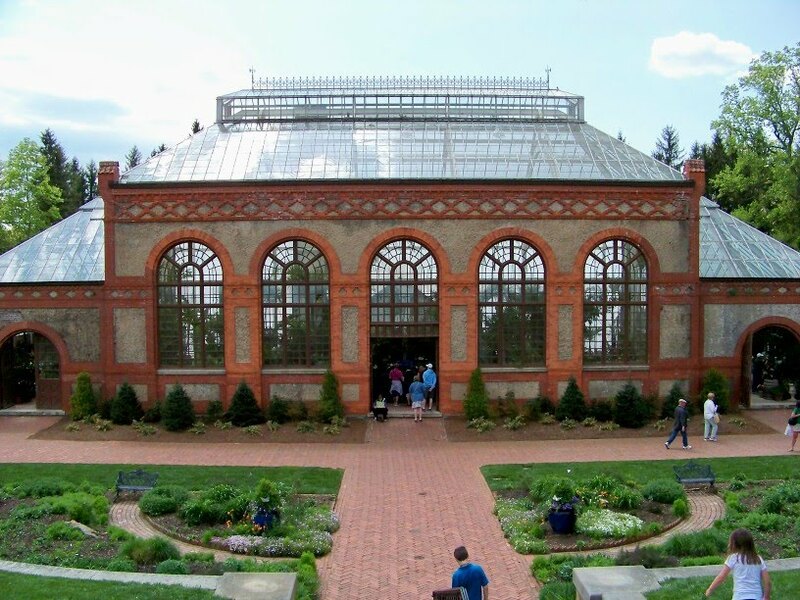 At 3pm a champagne toast and social hour will be hosted by Biltmore in the Conservatory. You must be wearing your Asheville Fling 2012 name tag that we will provide in your information packets to be served champagne or other refreshments. There are bound to be several hundred other people milling about. You will need to be identifiable. We will load the buses and head back to the hotel at 4pm. Saturday night's dinner is being served at the Asheville Masonic Temple, 80 Broadway St. directly across Woodfin St. from the hotel. Dinner begins at 6pm with light pupus - an assortment of timbales served with bread and crackers. Between 6 and 6:45 pm a lodge member will be available for guided tours of this historic building. Dinner will be prepared by and begin being served at 6:45 pm by the Colorful Palate. Alcohol is not allowed in the Temple. If you are thirsty for more than tea or lemonade there are a couple of bars right across the street. I hear tell if you mention you are at a function at the Masonic Temple you might get a discount, kama'aina rate. Entree cards with your meal choice will also be in your information packets (placed inside your name tag holder). Bring this card with you. It should be placed where you sit to aid the cater waiters. Your entree card will also have a number on it. This number is for the door prize drawings that will happen at Saturday's dinner. No entree card, no number, no chance of a door prize for you! You will get a swag bag filled with all kinds of garden goodies from our generous sponsors listed in our swag category on the Fling blog. To increase your chances for more garden goodies, don't forget your entree card. Homemade ice cream, including dairy free options will be scooped up by The Hop for desert. Dinner should conclude around 8:30 pm. Dinner will be followed by a discussion about the evolution of blogging led by Dee Nash and Pam Penick. This will conclude by 10pm. The lights will dim and flash and it will be time to leave the Masonic Temple for the streets of downtown Asheville. I hope I have covered everything for Saturday. We’ll be arriving after lunch in the River Arts District to spend a couple of hours at the NC Arboretum. 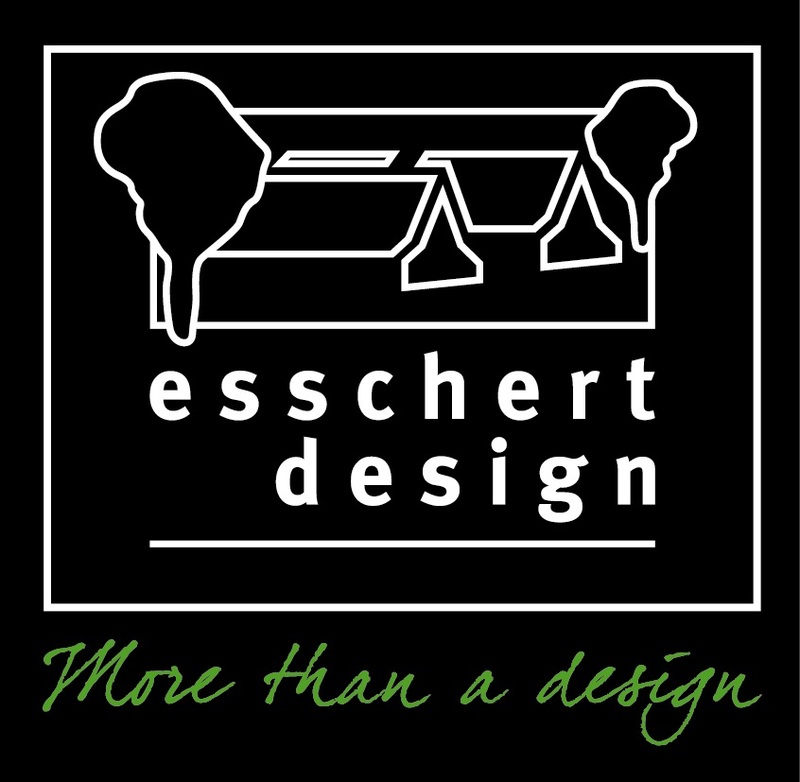 It’s a big place, so check out some of your options at their website. You’ll also have a map in your registration packet to help you preview your visit. The Arboretum recently celebrated its 25th anniversary (check out its history here) -- I've seen it expand and develop over the years, and have particularly enjoyed my recent visits as the gardens and trails have matured and expanded. You'll enjoy it! 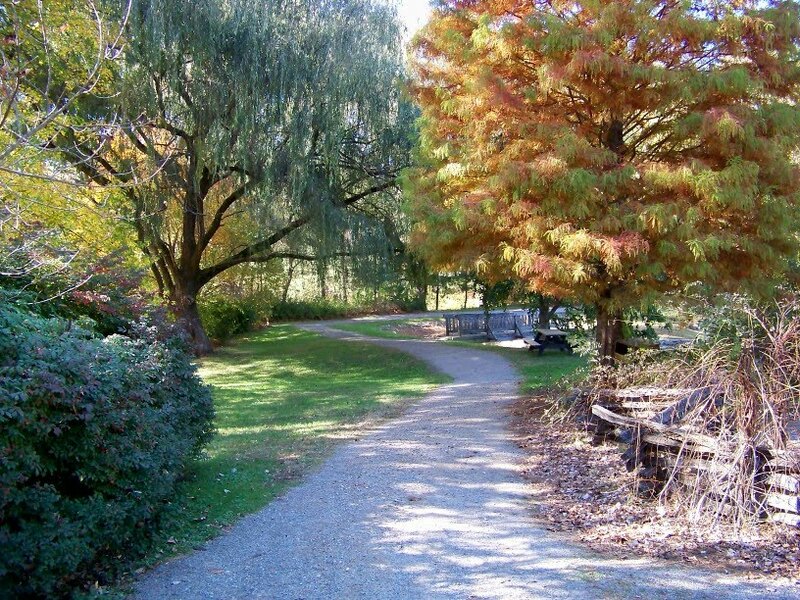 The Arboretum will have volunteers stationed in the Heritage and Quilt garden areas to answer questions, and visitor services staff in the Baker Exhibit Center can provide further information and brochures. 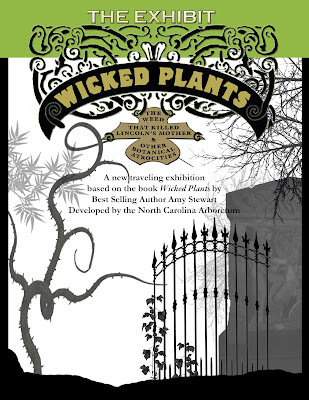 (While you’re there, don’t miss Wicked Plants: The Exhibit, based on Amy Stewart’s book of the same name, just opening. I'm planning to go to her presentation tomorrow. The containers and plantings around the Education Center are always a standout and change seasonally. The Bonsai Exhibition Garden displays native trees of the Southern Appalachians, and is exceptional, even if you're not that interested in bonsai. 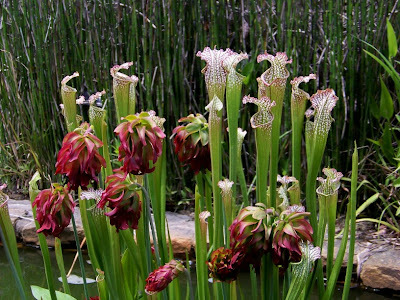 Strolls on the Plants of Promise Garden and the Natural Garden Trail provide an even better look at some of the native plants that make the Southern Appalachian such an exceptionally rich botanical region. 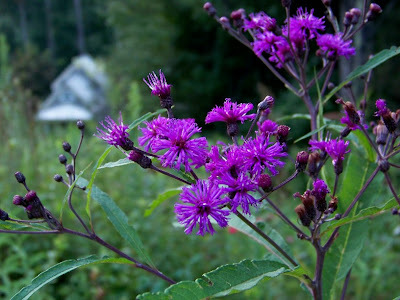 Interested in learning more about native plants of the Southern Appalachians? 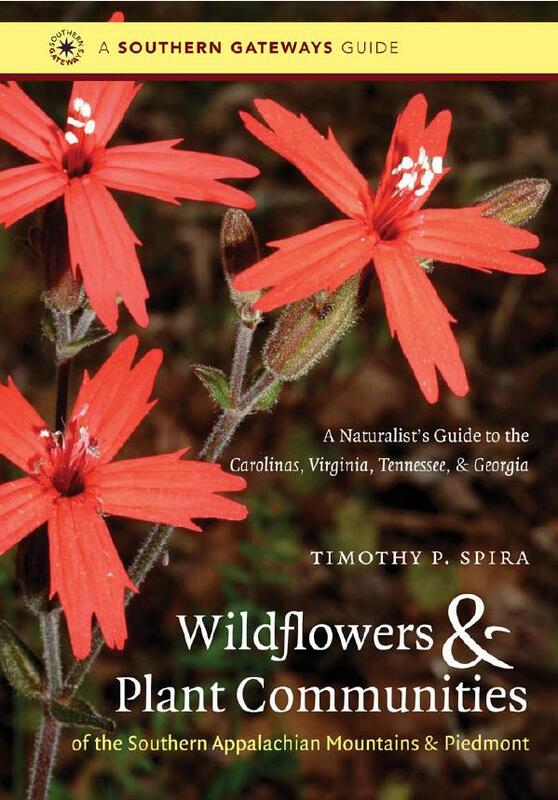 Join Tim Spira, author of Wildflower and Plant Communities of the Southern Appalachians and Piedmont: a Naturalist’s Guide for a closer look of some of our native plants and their ecology on one of two scheduled walks along the Natural Garden Trail in the Arboretum. Tim’s a plant ecologist, botanist, and Clemson University professor (he’s also a great native plant gardener). He’ll be starting the first walk right after the buses unload (~1:45 pm. ), from the parking lot, with a second walk starting at 2:30 at the entrance to the Plants of Promise garden outside the Education Center. You're going to love Asheville! Christopher has been doing an amazing job describing the gardens we're going to be visiting and evoking a bit of Asheville's essential quirky nature, too. It's part of what makes Asheville a special place. I hope you'll be able to spend some time before or after the Fling exploring our city and the surrounding mountains. Check out this New York Times piece for their take on '36 hours in Asheville'. As a part-time resident for the last three years, I've loved exploring the historic neighborhoods near downtown (on regular walks), enjoyed the vibrant downtown restaurant scene, and exploring the nearby trails in the mountains (not to mention all the great "natural gardens" nearby, too. Some of my favorite small gardens within walking distance of the Fling hotel (Sheraton Four Points) are marked on this map (you'll have a printed copy in your packet). The Google maps interactive version is here. Nan Chase, whose garden many of you have signed up to visit post-Fling, and I have also come up with a list of some of our personal favorite restaurants and other spots downtown. (You'll also have a copy in your packet.) But you won't go wrong almost anywhere in Asheville's historic downtown for a good restaurant! 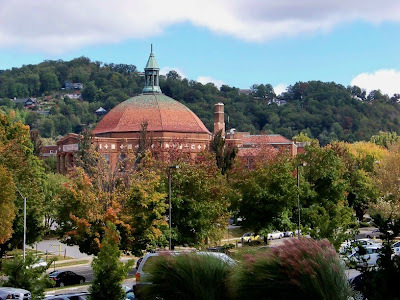 Asheville is a great town for restaurants and its local food scene, complete with numerous neighborhood tailgate markets served by farmers, artisan bakers, plant growers, etc., is remarkably vibrant. We're glad you're coming. It'll be great fun.